Two botanicals not often seen in gin appear in Hernö gin. Meadowsweet: Has a subtle. pleasant aroma, sort of similar to almond. Used in wines, jams and potpourri, but most pertinent to the gin Meadowsweet is traditional component of Scandinavian Meads. Lingonberries: also known as Cowberry in the states, this tart, currant-like berry is probably best known as the red jam sold in every Ikea everywhere. 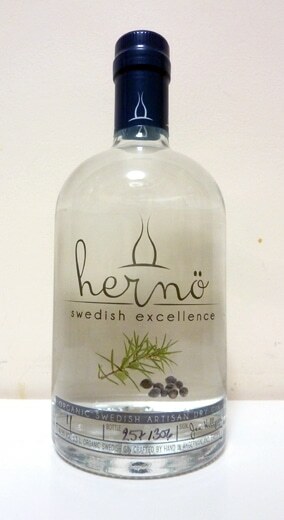 Hernö gin has a hint of juniper and an astringent berry-like flavor. Sweet smelling, not too intense. The taste is complex with an emphasis on fruity notes. Up front, jam and vanilla. Sweet creamy, pine and juniper build, come in later. Lemon cream pie with spicy notes of coriander. Just a touch grassy, like a fresh floral meadow. The finish is long and fruity, vanilla and tart berries. Occasionally giving off a note similar to that of fruit loops cereal, but decidedly more sophisticated, I assure you. Smooth and finishes with a clean dash of pepper in the back of the throat. The flavors are bold and stand out even when mixed. I thought the Aviation worked quite well with Hernö Gin, taming the slight tartness and leaving a refreshing jammy character. I also thought it mixed really well with jam in cocktails, retaining its point of view. Although we’re talking a mere 81 proof, the flavors are quite intense and not easily tamed. I thought it stood out, but I’m not sure the flavors worked. Great in a martini, and a nice, although slightly more astringent in and gin and tonic, with a fruit note that reminded me of cranberry coming out. Surely the Lingonberry coming through. Nice, and with a different take on the contemporary formula. The notes that the lingonberries bring to the drink add a jammy note which one could say is “decidedly Swedish” in character. Truly a gin which brings a sense of place to conversation about what a contemporary gin can taste like around the world. A British gin or an American gin using something like Lingonberries might feel “gimmicky” but in a gin from a Swedish distiller it tastes authentic, striking and quite good. * Since it’s launch in 2011, the title of “Northernmost Distillery” has been passed around a few times. Currently, it seems to be held by Aurora Spirit Distillers who work out of an old NATO base. I really like the fresh and crisp pine and juniper notes in Hernö. It reminds me of cold winter mornings in the forest. Works really well with Fever-Tree Tonic and really bad with Fentiman’s Tonic.